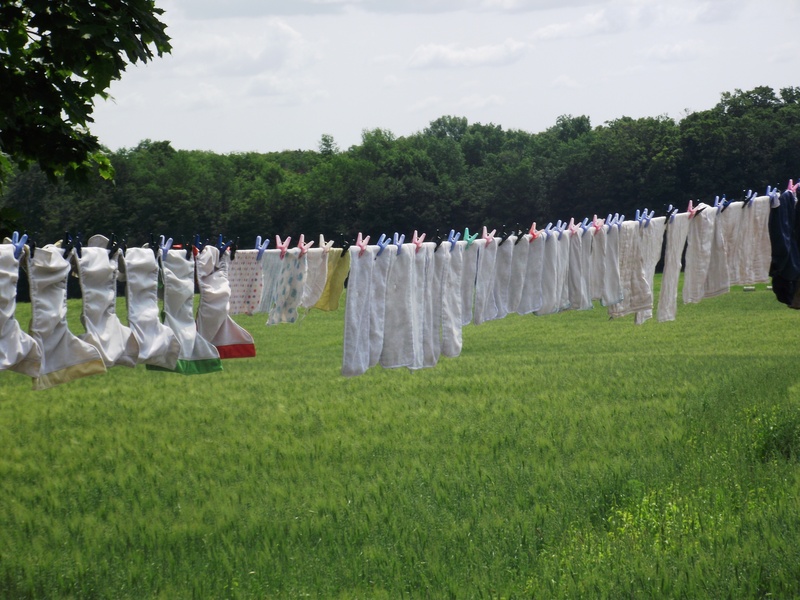 I grew up on a farm, and as a child, my parents, grandparents, and neighbours always hung their laundry outside to dry. 1. It is effective. Unless the weather happens to be wet or humid, our laundry always dries completely. 2. It is energy efficient. Drying laundry outside harnesses both wind power and solar power to get the job done. 3. It is contagious. When our neighbours saw our laundry outside, they started putting their laundry out too! 4. We do not need to run the hot and noisy dryer which keeps our home cooler. 6. Clothes last longer when they are not subjected to regular time in the dryer. All those little pieces of lint that are caught in the dryer are actually little tiny pieces of clothing being worn away. Also, they don’t shrink as much and they look newer longer. 7. As the moisture evaporates from the clothes and sheets, they are left with the most beautiful scent of warm sunshine, fresh air, and summer days. Oh how I love the feeling of slipping into fresh sheets at night that have been blowing in the breeze and warmed by the sun! 8. My toddler absolutely loves to help with the laundry, and when we bring the clothes, sheets, and towels outside, his excitement reaches a whole new level. 9. Drying our clothes outside brings back happy memories from when I was a child. I remember my mother and my grandmothers hanging up their laundry in the early morning when there was still dew on the grass. I remember watching it blow in the wind all day and sometimes get tangled up on the clothesline. And I remember having to go on a scavenger hunt at the end of a very windy day to pick up all of the items that had blown away. 10. Hanging laundry outside just feels good. It is exhilarating. For all of the reasons listed above, hanging our clothes outside just makes me happy. Do you dry your clothes outside? I would love to hear about it in the comments below!